In this lesson, I showed you a way to organise key centres for practising things in every key. 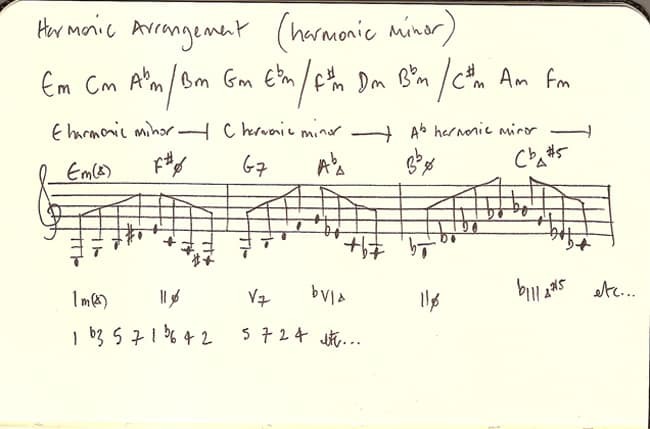 Here’s another example of using a harmonic arrangement to practise in every key, but this time in Minor Keys. In this exercise, you play two consecutive seventh chord arpeggios as in the picture. And then you change key, and move to the nearest arpeggio. Say the chords names as you go: E-∆, F#-7b5 etc. Say the function of the notes.